Welcome to the Bay of Islands, or, as you might come to know it, the Angler’s Eldorado. Within as little as half an hour of our idyllic shores lie some of the best fishing grounds on the planet, and our very own Russell – New Zealand’s first capital city (as difficult as it may be to imagine of this quaint little town today) – is home to the second oldest game fishing club in the world. His prophecy has proven to be accurate. Almost a century on, anglers are still flocking to our waters in droves during our big game fishing season (December until end of April), in pursuit of the world class experience the Bay of Islands promises. They do not leave disappointed. A large number of world records are held in our region, including almost all world records for the Striped Marlin and Yellowtail Kingfish – which are rarely found larger in any part of the world. For just about as long as there have been humans in New Zealand, there has been game fishing, but our equipment and techniques have been somewhat refined over the centuries! 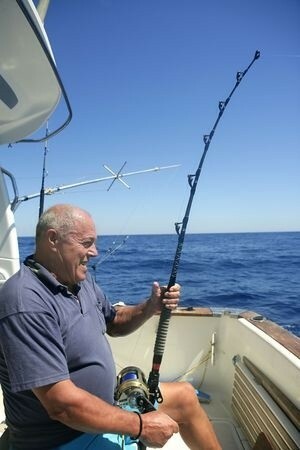 Time has moved on since the days of catching swordfish with hand lines from waka and knuckle duster wooden reels. Now, catching the most impressive big game species relies on the far more user-friendly launches, whippier rods, geared wheels with brakes, trolling and berley trails. If you’re after something a little smaller, check out our Bay of Islands Fishing page! Striped, blue, black – massive specimens of each are thriving in the waters around the Bay of Islands. The striped marlin and blue marlin are both a common catch in these parts, while black marlin are rarer. New Zealand’s marine environment is home to some of the largest of these species in the world, with weights typically ranging from 70 to 220kg. Since 2001, recreational captures of these fish have been in higher numbers than ever before after a moratorium was placed on their commercial catch and sale. Now, over 50% (often up to 75%) of marlin caught are tagged and released. The best months for striped marlin are between January and April; blue marlin between January and May; and black marlin between February and March. The Bay of Islands is one of the best places in the world to catch a whopper like the broadbill swordfish, which commonly weigh in at between 120 and 250 kg, with record weights much higher. The best months to fish for this species are between March and July. Another species of which the waters around the Bay of Islands boasts the biggest in the world, and holds most of the world records in, is the yellowtail kingfish. Said to be one of the greatest fighting fish in the ocean, this species can be caught all year round, but are in their highest numbers between March and July. The most common tuna found in our waters is the yellow-fin tuna, with the blue-fin tuna also out there but rare. These fighters can weigh up to 70kg and grow up to 2 metres in length, and are best caught by trolling with bait-fish. They can be found any time between January and July, but are best targeted in March. Home to mako, bronze whaler, thresher and blue sharks, the Bay of Islands is a great destination for targeting these species all year round. Your best chances of success lie between December and April.